Boyce Stretton was born in Hertfordshire in 1937. 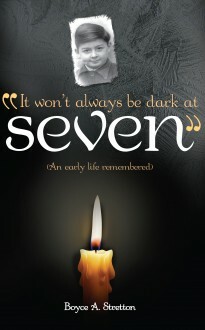 It Won’t Always be Dark at Seven… tells the story of his early life; his impoverished infancy in County Durham, his sometimes uneasy transition to a more affluent life on the Isle of Wight, and finally his career as a boy soldier before enlisting with the Royal Dragoon Guards. Packed with period detail of a way of life now long forgotten, It Won’t Always be Dark at Seven… is also a moving reflection with the perspective of half a century and a recognition that, while life is lived forwards, it can only be understood backwards. Boyce Stretton died in July 2011, a month short of seeing his memoir in print.